Last I wrote, I was just moving into my new place and incredibly stressed. Living out of boxes is one thing; baking out of boxes is another. I’m only slightly more settled now, and coming off two crazy weeks of baked good orders. Just when it looked like I was going to be able to start writing again, my laptop — which had been clinging to its last life for the last six months now — took its very last breath. Worse still, all of my food photos from the last year+ are — err, were on there. Many moons ago (or maybe just five months), I was an all-out oatmeal hater, but as you may recall, an early morning encounter with a bowl of pb&j oatmeal had me singing a different tune, and I haven’t looked back since. And you probably thought I was going to have to give up my KitchenAid mixer. Remember when I said I wasn’t a breakfast person? And how I wasn’t an oatmeal person? 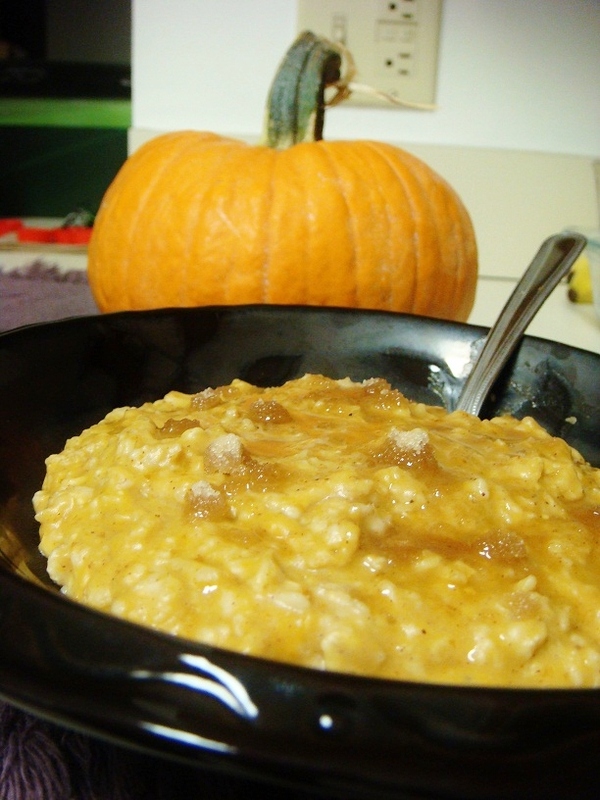 Well, what a difference National Oatmeal Month can make: I am now obsessed with oatmeal. After I tried out LiveWell 360’s peanut butter cup oatmeal last month, I went out an bought a 42-ounce cannister of old-fashion oats. I thought, “How will I ever finish this?” But here I am, a little more than a month later, and the lot is almost completely spent. 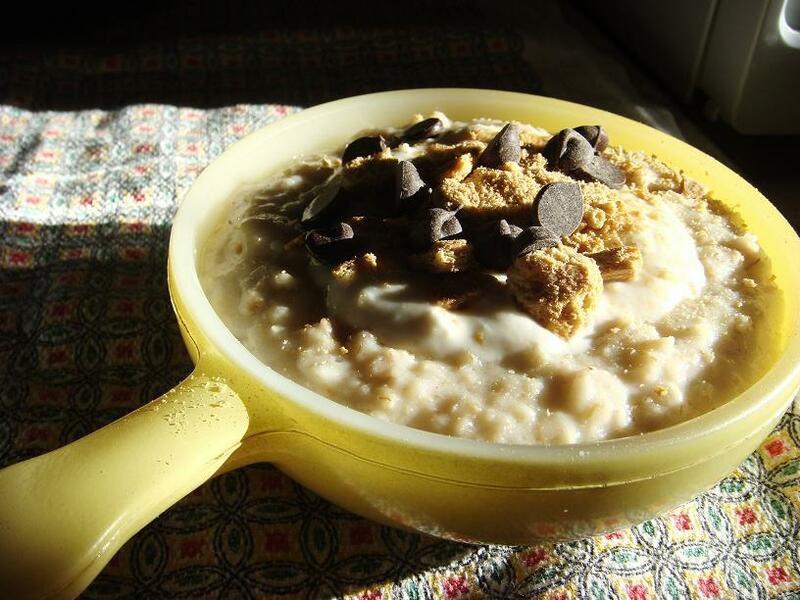 I’ve been trolling the Internet for creative recipes — oatmeals, granolas, cookies. I hope you’re ready for the impending barrage of oat treats. In honor of National Peanut Month — and a belated Peanut Butter Lovers Day (March 1) — I give you the simple-but-delicious peanut butter and jelly oatmeal (adapted from LiveWell360). Heat oats, milk, water and salt over medium heat until it reaches a simmer (about five minutes). Add banana slices and stir to break them down completely. 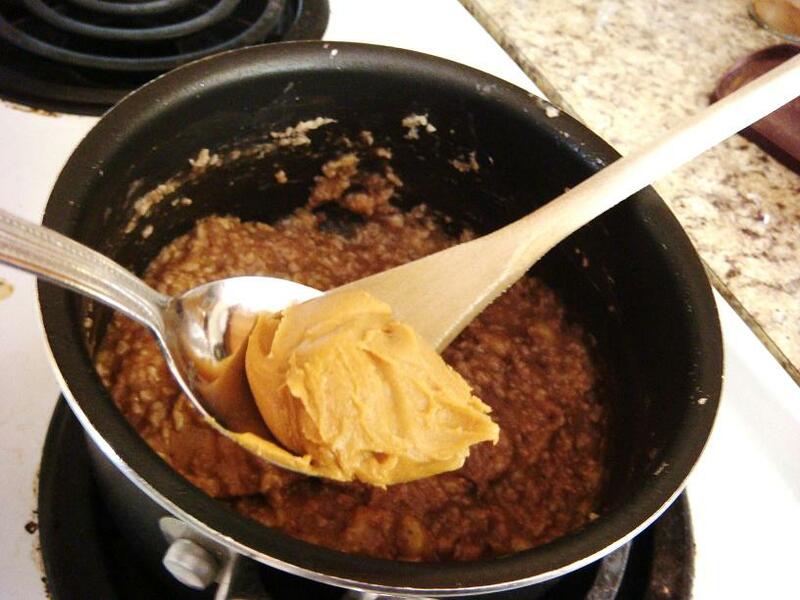 Pour oatmeal into bowl, add peanut butter and mix. Top with jelly, and mix. Cost? $2.50 peanut butter, $2.50 jelly, $2 cannister of oats for endless bowls of PB&J; 20(ish)¢ per banana. Overall success relative to expectations? 10 out of 10. This recipe was full of “not my thing.” I didn’t really like breakfast; I only ate oatmeal — instant, at that — if I absolutely had to; I shy away from peanut butter unless it’s wrapped inside chocolate (and frozen, like the stash of Reese’s in my freezer); and I haven’t eaten a PB&J sandwich since I was 8 years old. All that being said, I couldn’t believe how much I loved this. Every night for the next four days after I made this, I went to bed anxious to wake up and have it again. It’s that good. The banana is purely for consistency (you can’t taste it at all), and you can control the amounts of peanut butter and jelly just as you did/do for your classic PB&Js — plus no crusts to remove! I know so many people who say, “I’m not a breakfast person.” I’m not either — I find the options limited and my culinary creativity stifled with breakfast foods — but having a little sumthin’ sumthin’ in the morning gets my day going, so I’ll usually grab an English muffin and count the minutes until I’m hungry enough for some midday masterpiece. My breakfast-bitter brain was blown last week, though, when I embarked on a National Oatmeal Month celebration with LiveWell360’s peanut butter cup oatmeal (slightly adapted). In addition to not being a breakfast person, I’m also not an oatmeal person, but this recipe looked simple and inexpensive (especially considering I “borrowed” a handful of oats from my roommate’s stash), so I gave it a go. Heat oats, water and salt oats in a saucepan over medium heat. Once simmering, stir in bananas and mix until thickened. Add vanilla, cinnamon, cocoa powder and sugar until mixed. Either pour mixture into a bowl and top with peanut butter, or — as I did, at left — mix peanut butter into heated mixture because you can’t gracefully get it off the spoon. Total time? 10 minutes, start to finish. Overall success relative to expectations? 6 out of 10. The taste wasn’t exactly what I was expecting, — not like biting into a Reese’s — but I still enjoyed it. The banana is virtually undetectable, but helps create a nice, thick consistency. 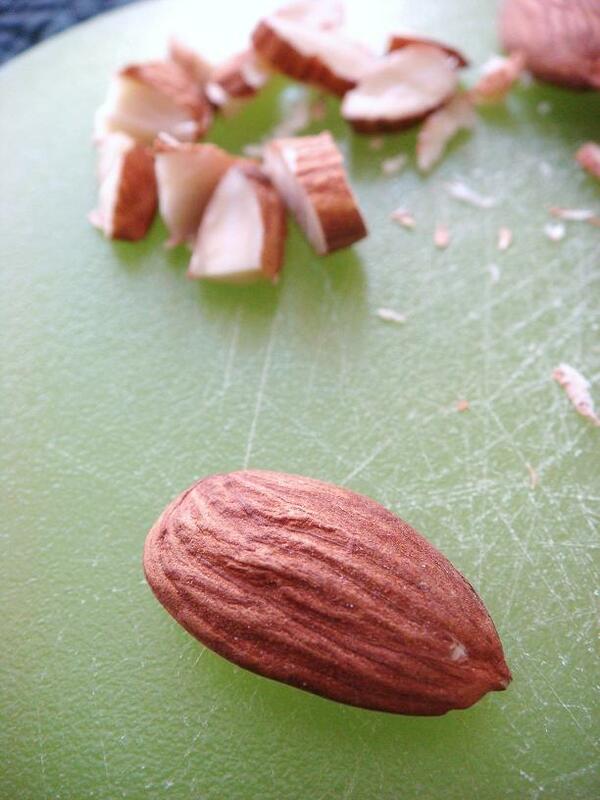 The cinnamon was a little strong, so I’d probably drop that down to 1/8 tsp. next time. 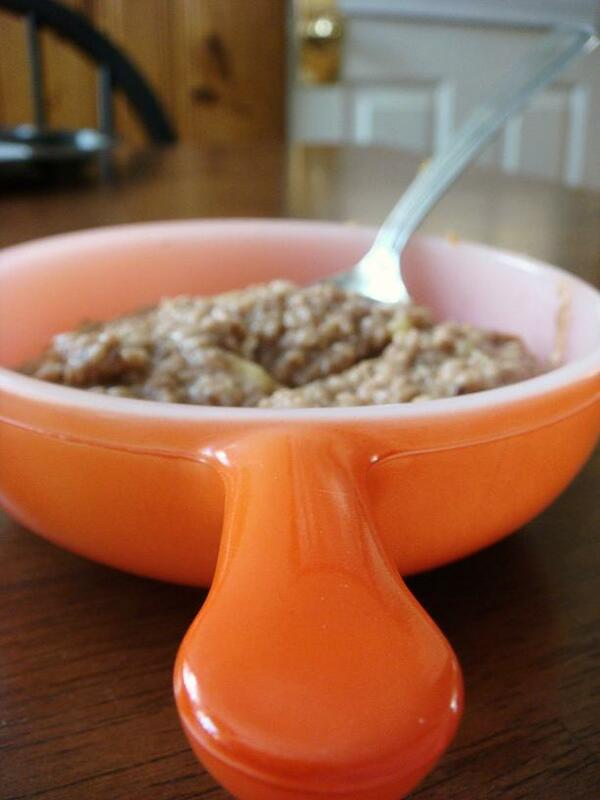 If this isn’t your thing, but you’re still interested in celebrating the last two weeks of National Oatmeal Month, check out the 30-Day Oatmeal Challenge for all sorts of crazy concoctions.